For some, it fulfills a childhood dream. For others, it assists in actualizing a career interest. For all, it is an avenue for exploration that reveals unwritten clues about the nation’s past. The Summer Archaeological Field School, a collaboration between the Colonial Williamsburg Foundation and William & Mary, has just finalized its 34th year of educating students and enhancing the area’s archaeological record. The longstanding partnership has fostered an opportunity for students to broaden their understanding of anthropology, gain invaluable field experience and contribute to the broader goal of investigating Colonial Williamsburg’s rich history, according to Mark Kostro M.A.’03, Ph.D.’18, senior staff archaeologist for the Colonial Williamsburg Foundation and adjunct professor. As an Archaeological Field Methods class in the Department of Anthropology at W&M, the 5-week field school provides students with exposure to the tools and techniques of archaeological field work. Student participants are taught how to read and excavate soils, identify artifacts, and piece together evidence to tell a story about the history of a site. Taught during both summer sessions, this year’s classes took place from May 29 to June 29 and July 2 to Aug. 3, and focused on a site within Colonial Williamsburg’s Historic Area. In recent years, under Kostro’s instruction, the school’s training has incorporated an emphasis on the communication of archaeology to a non-specialist audience. Beyond learning the technical tools of the trade, students in the field school are instructed on how to portray their work to Colonial Williamsburg visitors. 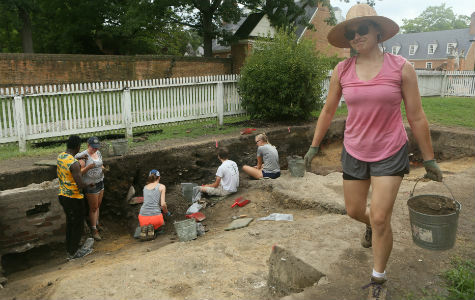 The partnership between William & Mary and Colonial Williamsburg has not only fostered an ideal opportunity for students to convey archaeology to the public, but has also symbiotically expanded the historical understanding of both institutions. “Through the collaboration, we’re able to leverage the resources of Colonial Williamsburg and William & Mary together to pursue projects that help both institutions understand the past in ways that one or the other couldn’t do by themselves,” said Kostro. Past excavation sites have included the Brafferton, where the program’s young archaeologists learned more about the Native American students who attended the Indian School, and the Bray School, where students assisted in a Lemon Project initiative to understand the history of the 18th century school for free and enslaved African American children in Williamsburg. 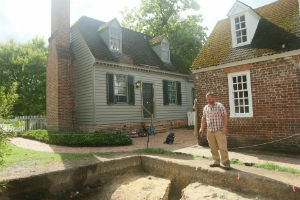 This year, students are benefiting from the unique location of Colonial Williamsburg, excavating a trash dump at the Robert Carter House, the eighteenth-century home of several generations of prominent Virginia politicians. Prominently situated within Colonial Williamsburg next to the Governor’s Palace, the Robert Carter House was an attractive choice for the group’s newest project because of its enigmatic position in the historical record. Robert ‘King’ Carter, builder of the family townhouse, was the wealthiest man in Virginia and acting governor of the colony during the property’s development. He and his descendants were well-respected in Virginia politics and commerce as everything from colony treasurers to elite planters. Of particular interest to the program’s archaeologists was Robert ‘Councillor’ Carter III, grandson of ‘King’ Carter and elite planter known for his 1791 Deed of Emancipation that called for the gradual manumission of 452 enslaved people. Last year, the field school began excavating the area directly behind the main house, identifying features related to the property’s 18th century pleasure garden. This year, the team has redirected their exploration to the margins of the property where previous investigations showed promise of providing more answers about the property’s unfamiliar history. Unearthing and analyzing such artifacts as oyster shells, animal bones, ceramic plates and bowls, and glass bottles, students participating in the 2018 Summer Archaeological Field School have turned trash into treasure. A discovery as seemingly straightforward as food remains holds clues about the unwritten diet and habits of the 18th century residents of the Robert Carter House, said McGee. Hallie Nichols ’20, a William & Mary geology major and field school participant, articulated the distinct feeling of uncovering an artifact and shedding light on the Robert Carter House mystery. “We learned about all these different ceramics. It sounds boring when you’re in the classroom, but when you’re out there and you find the ceramics you just learned about, you think, ‘Oh my gosh, I just found this,’” she said. This year’s efforts at excavating the trash dump have exposed evidence of food waste from the home’s kitchen that provides a fresh image of 18th century life in the Robert Carter House and the Williamsburg area. “The people making these meals were most likely enslaved Africans. We’re learning about the cooks, laundresses and other domestic servants – those people you often don’t know a lot about when you’re talking about 18th century Williamsburg, ” said Kostro. 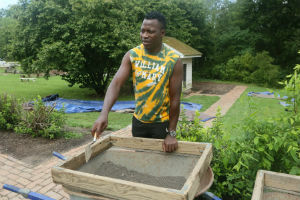 The team’s discovery of simple everyday items, such as the food remains, have the potential to unveil a more refined image of this historical period – one that accounts for the activities enslaved people engaged in, the food they prepared, and the space they inhabited, Kostro said. Kostro emphasized that archaeology accompanies a rare capability of uncovering and understanding that which is left out of other historical narratives. For McGee, participating in the field school for two years inspired her decision to major in anthropology, caused her to consider a career as a field archaeologist and reconstructed her perception of the relationship between history and anthropology. “I think archaeology is important because it tells you things that people didn’t think to tell you in texts,” she said, echoing Kostro’s sentiment about the unique power of the field.